It is a floating 25in tablet for three and a half grand? Why is Microsoft ploughing this narrow furrow when so many more people are looking for a direct alternative to the iMac? And finally, the “who”: who the heck will buy this machine? I’ll start, though, with the easier “what exactly is the Surface Studio 2?” question. As the “2” gives away, this is a second-generation product, the successor to the original Surface Studio released in the summer of 2017 in the UK. It’s essentially a 25in Surface tablet mounted on a clever arm that allows it to move between a 90-degree vertical and an almost flat 20 degrees. Think of it as an artist’s easel or architect’s drawing board, able to shift position to meet your needs. All the computing power is built into the squat silver box that acts as the base, which Microsoft has kept unblemished with views of stickers or indeed ports – instead it follows Apple’s lead and stuffs these all into the rear panel. It looks stylish in a minimalist, Bauhaus kind of way, but is a pain when you need to reach round and insert a USB stick or cable. Notably, though, the only cable that you’re obliged to insert is the power cord, with both the keyboard and mouse working over Bluetooth. The rear is also the first sign of change from the original Surface Studio. The four USB-A 3 ports remain, but the mini-DisplayPort has been replaced by a versatile USB Type-C 3.1 connector. This can output to two 4K screens at 30Hz or a single 4K screen at 60Hz, or you might prefer to attach a fast external SSD or a docking station. Note there’s already a Gigabit Ethernet port, along with a 3.5mm audio jack and full-size SDXC card slot. Microsoft has naturally upgraded the internals, although it’s surprising to see a seventh-generation Core processor in place rather than an eighth-generation chip. It’s the respectable 7820HQ, though, with the HQ standing for “high performance” integrated graphics and “quad-core”. With the help of faster 2,666MHz DDR4 memory (it was 2,133MHz) and a 1TB SSD – the first generation of Surface Studio included a hybrid disk with 128GB of SSD storage and a 1TB or 2TB hard disk – the Studio 2 proved significantly faster. Let’s take a look at the Surface Studio 2's media-focussed benchmarks. An overall score of 135 compares well to the 120 of its predecessor, with the biggest jump coming in multitasking: 142 versus 123 is a comforting sign that this machine will cope with demanding workflows. I’ll add one caveat. When the Studio 2 is pushed, particularly in games, the fans jump up in volume. It’s never Hoover-like, but it does become noticeable. I’d still take this over the original Studio, though, which emitted a constant fan whine when we tested it. The severe cooling helped the CPU to hit solid results of 4,777 and 16,026 in Geekbench 4 (single core and multicore), while a Cinebench R15 CPU score of 734 is again a decent result. It's not up there with some of the top workstations on the market, but enough to show that this machine can cope with workstation-level tasks if you’re prepared to wait. There’s a healthy amount of 3D acceleration, too, with a mobile GeForce 1060 GTX graphics chip inside. That compares to the GeForce GTX 980M we tested in the first Studio, and we saw a marked jump in gaming performance. Playing Metro: Last Light with maximum detail settings at the screen’s native 4,500 x 3,000 resolution is still impossible, scoring 9.9fps with SSAA on, but that compares to 6fps previously. And while dropping to 1080p produced a 117fps average (with SSAA off and most settings at normal), it also produced a fuzzy image; a decent compromise comes at 3,000 x 2,000, where we saw averages of 48.9fps with SSAA off. It’s a similar story in Rise of Tomb Raider, where a score of 23.3fps at native resolution and Very High settings isn’t quite satisfactory. However, drop down to High and the average hits 27fps, while Medium settings boost this to 31fps. More importantly, the game is actually playable at this setting. Another upgrade has nothing to do with the Surface Studio 2 but the bundled Surface Pen. This is now sensitive to 4,096 levels rather than 1,024, and, although I’m not a good enough artist to tell the difference, this means more skilful painters have yet more control over what appears on-screen. If you’re trying to replicate the layers of oils in a painting, it’s that much more sensitive. Even before this upgrade, though, the Studio’s screen was a joy to draw on. The near-flat position is a natural angle to tinker with, and almost everyone who passed the computer, with Paint 3D on the screen and a white canvas sitting ready, couldn’t resist picking up the Pen and drawing something. It’s an excellent way to experiment with materials, too. If you’ve ever fancied yourself as a watercolour artist, or perhaps want to dabble with oils, all the tools are sitting there for you. Yes, it’s a simulation rather than the real thing, but the results can be stunning. Before Microsoft sent me this unit to test, I attended a briefing it organised with a professional artist who uses Surface products to create. He said he fleshed out his ideas in Sketchable before moving to Art Rage to turn sketches into final works, and it was interesting watching him at work – he held the Pen more like a brush, zooming in to add final details. Why not follow the conventional digital artist path of graphics tablet, I asked? His answer centred around how much more natural it felt to draw on a screen directly, praising the Surface Pen for having no lag, and that it completely ignores your palm. Naturally, you have to factor in the fact that he had been selected by Microsoft to talk about this product – there are probably hundreds of digital artists who would far prefer a tablet – but he was still a convincing advocate. Even I, with my limited drawing ability, could produce half-decent results, while my far-more-adept daughter produced a couple of excellent drawings within half an hour. Moreover, there are highly respectable apps that take advantage of the Studio’s talents: if you own a Windows tablet or laptop with a touchscreen, give Sketchable and Art Rage a try. Nor is this device just for drawing. We know that architects and graphic designers are two prime markets Microsoft is aiming at, but anyone who needs to flesh out concepts – and who might currently use, for example, a whiteboard to do so – could use the Surface Studio. I admit, though, it’s an expensive whiteboard replacement. I was hoping to be equally impressed by the Surface Dial on the Studio 2, but it wasn’t to be. Perhaps it isn’t surprising that Microsoft doesn’t bundle it because it doesn’t have the level of integration with apps that it needs. Microsoft’s artist friend says he uses it to undo mistakes, and that it’s also good for panning and zooming, but I await the killer usage that justifies its £90 asking price. I ended up using the Dial to adjust the volume and for scrolling through web pages, and it doesn’t help that it slowly slips down the screen even when the Studio is in its flattest position. Moving back to ordinary life, much of the time the Studio 2 will surely be used as an all-in-one PC. The key here is screen quality, and you won’t be disappointed. First off, it’s colour-accurate. Incredibly so. It can reproduce 99.9% of the sRGB colour space, 84.9% of Adobe RGB and 96.9% of the video-focused DCI-P3 space. Add a brilliantly low 0.41 average Delta E (and a maximum of 1.28), and you have a similar level of quality to a professional display such as the ProArt PA34VC. Want to kick back and watch movies? It’s just as happy, with a strong 1,287:1 contrast ratio and a peak brightness of 521cd/m². Even in dark scenes favoured by modern directors, it picks out the detail and there are no hideous artefacts. The stereo 2.1 speakers sound astonishingly good, too. I would happily sit in front of the Studio 2 and let it stream Spotify all day, without even thinking about switching on separate speakers. While Microsoft doesn’t quote a response time, I saw no ghosting when playing games. Instead, the biggest problem is that games may not offer you a 3:2 aspect ratio, so you’ll be stuck with black bars at the top and bottom of the screen. Serious gamers will want to replace the wireless Surface Keyboard and Surface Mouse, both of which are bundled with the Surface Studio 2, but for my level of play they proved absolutely fine. Bearing in mind how fashion-conscious the rest of the design is, it’s surprising that Microsoft has chosen to stick with such a plasticky design for the keyboard in particular, but I would still be quite happy using it (and the mouse) on a daily basis. 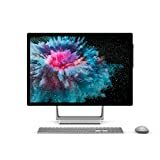 If you’re the kind of person who takes a logical approach to buying computers, there really is no justification for buying the Surface Studio 2. Even if you’re a graphics artist or a designer, there are much better value offerings out there. It doesn’t help that Microsoft is a step behind when it comes to the processor; when you’re spending this much, you really want the best components money can buy. And yet there’s something illogically wonderful about the Surface Studio 2. The way the screen glides into position is nothing short of genius, and due to the angles you can work at – and the excellent stylus – it opens up new use cases that no other all-in-one can currently match. And as I say, buying the Surface Studio 2 defies logic anyway; for most of us, this is a purchase of the heart, not the head. If you decide to take the risk, though, I suspect you’ll be delighted with your choice.